While some cats get along with dogs and share a house and play with them nicely, there still are those typical “TV show” cat-dog relationships out there where the cat is hissing at the dog and the dog chasing the cat. Sometimes cats and dogs just don’t get along and sometimes they are forced to live in the same house. That is, unfortunately, the case for this poor kitty. He’s a 9 year old cat that her family rescued off the streets. His life was pretty good and he got all the attention until his family told him that they were getting a new puppy. That day, he eagerly awaited the dog’s arrival and sat on the couch staring out the window and wouldn’t move. 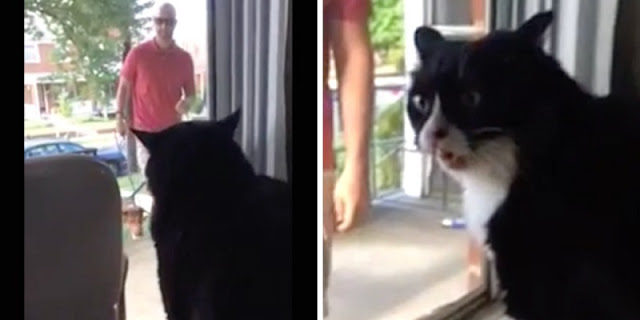 Immediately when he saw his dad bringing the dog up the stairs, his reaction had the family bursting into tears of laughter. He then begins aggressively hissing and growling at the dog and is not happy that he will now have to share a house with a pup. It almost sounded like he was screaming and having a panic attack. It was very clear that he didn’t want the dog to come in and that it should stay on the porch. Watch his hilarious reaction in the video below, and try not to laugh! Hopefully, now the kitty and pup are best of friends and getting along now that they’ve had time to adjust. If this cat’s hilarious reaction gave you a laugh please SHARE with everyone you know!